Among the many accomplishments of the 2018 collective bargaining agreement is a host of new or expanded bonuses to compensate SEIU 721 members for working special assignments, hard-to-fill shifts, etc. But, even though these agreements were reached at the end of September and approved by the Board of Supervisors on November 20, employees have still not received the bonuses. 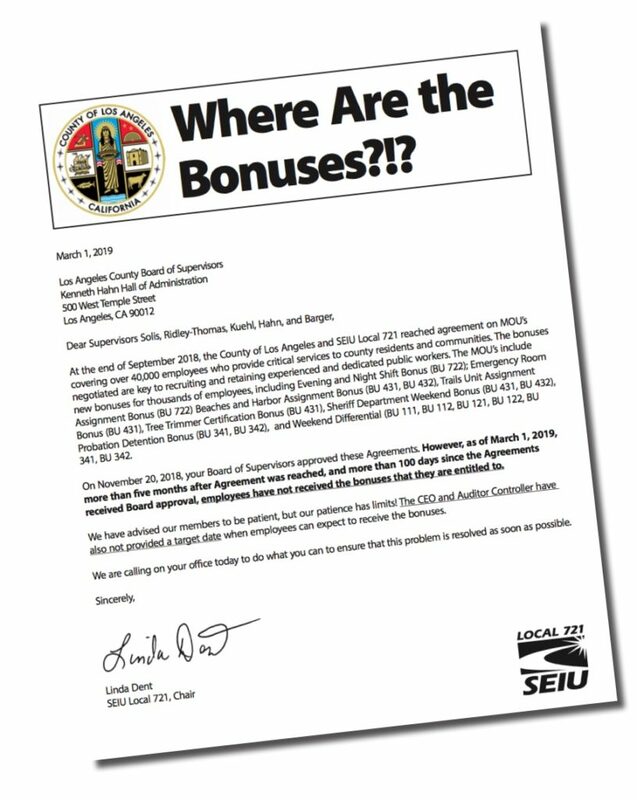 After filing several grievances, on March 1 a letter from SEIU 721 Vice President Linda Dent was hand-delivered to each of the County Supervisors. It produced immediate results: a high-level meeting between the CEO, Auditor Controller and LACERA was convened on March 8 to end the delay. The Bonuses Will Be Pensionable. As it turns out, the delay has been caused in part by confusion over whether or not the bonuses are pensionable. That issue has now been resolved. The bonuses WILL be pensionable. But, the Board of Supervisors must approve a new letter. This is expected to happen by April 2. Then, the LACERA Board of Retirement will rule on the pensionability of the bonuses at their meeting of April 11. Once LACERA takes this action, the Auditor Controller can begin to process the bonuses. If all goes well, the bonuses will be reflected on April 19 or May 3 paychecks. For more information please contact SEIU 721 Member Connection at 1-877-721-4968.